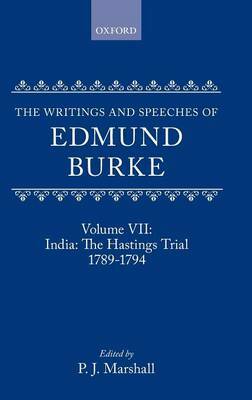 This key volume specifically completes the collection of Edmund Burke's Indian Writings and Speeches which is set within the series, and is both an exposition of Burke's views on India from his coverage of the Hastings trial, and his views on maintaining the rule of a universal justice. The texts for the items, which have appeared in previous editions of Burke's Works, have been reconstructed, largely by the use of manuscripts. Indeed many of the shorter speeches appear here in print for the first time. The volume includes a key speech which introduced one of the main charges in the trial of Warren Hastings on an impeachment from 1789-1794, and an important report on the conduct of the trial. It closes with the enormously lengthy and significant speech in which Burke summed up the prosecution's case over nine days. However, this volume is not only a full exposition of Burke's views on India but contains much of great interest about other aspects of his thought. In particular, Burke saw himself in these years as being engaged in a battle against the lawless disruption of society, both in Europe and in Asia, in order to maintain the rule of a universal justice, a main theme of this volume.